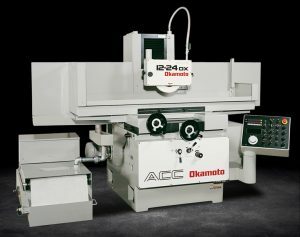 ACC-DX Series Grinders are many of the most widely used grinders in existence. They are easy to operate and deliver consistent performance, accuracy and reliability unmatched by any grinder in their class. They are loaded with many standard features that make them the value leader in automatic surface grinders. Solid state ergonomically design control. Full width tables eliminate overhang. High precision wheel spindles with super-precision, pre-loaded bearings.